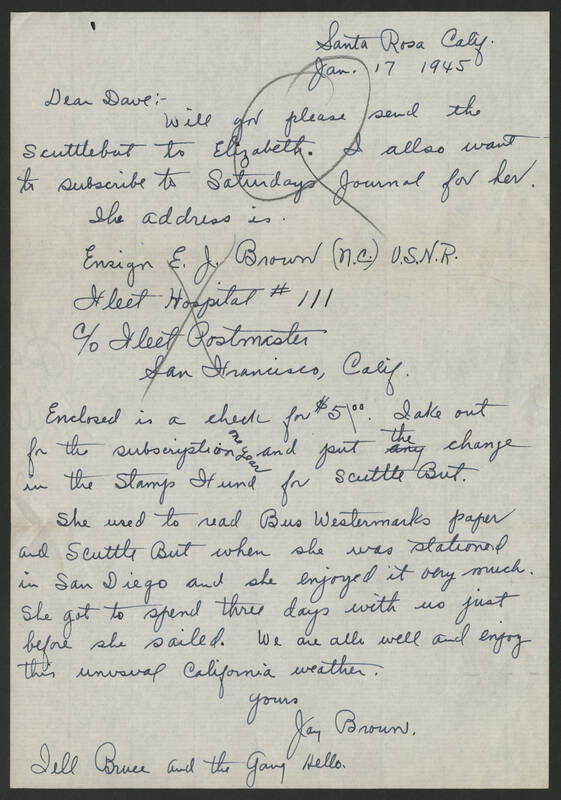 Santa Rosa Calif. Jan. 17 1945 Dear Dave:- Will you please send the Scuttlebut to Elizabeth. I allso want to subscribe to Saturdays Journal for her. The address is. Ensign E. J. Brown (N.C.) U.S.N.R. Fleet Hospital #111 c/o Fleet Postmaster San Francisco, Calif. Enclosed is a check for $5/00. Take out for the subscription one year and put the change in the Stamp Fund for Scuttle But. She used to read Bus Westermarks paper and Scuttle But when she was stationed in San Diego and she enjoyed it very much. She got to spend three days with us just before she sailed. We are all well and enjoy this unusual California weather. Yours Jay Brown. Tell Bruce and the Gang Hello.